One moment Mia has her eyes closed, head leaning against the car window and is listening to classical music on the radio. The next, she is being rushed to hospital having been taken from the wreck of her parents' car. Mia watches as the doctors frantically try to save her life, and as friends and family gather at the hospital. 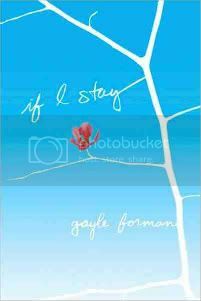 If I Stay is narrated by Mia as the reader follows her out-of-body experience in the unfolding 24 hours. Mia has to come to terms with what just happened, with how life was before the crash and what might come afterwards. She has no choice, but to make the most difficult decision of all. The story takes us through not only what Mia is going through, but to flashbacks of her life before the accident. We get to know her Mom, Dad and little brother Teddy, as well as her best friend Kim, boyfriend Adam and family friends Henry and Willow. Before the accident her toughest choice was whether she could leave Adam to go to Julliard to play the cello, but now she has the most difficult choice of all to make. Music envelopes this story. Beethoven's Cello Sonata no. 3 is playing at the time of the accident. Mia plays the cello, in fact she plays it very well (well enough to audition for Julliard, at least!). Her boyfriend Adam is in a band and her Dad used to be. The whole book seems to have a soundtrack running through it. This is an emotional read. I had tears in my eyes or streaming down my face at least 3 times during this story. You can only begin to imagine the heartache Mia must be going through and pray that this never happens to you or your friends & family. It isn't just about the accident and the choice Mia has to make. If I Stay also has a love story running through it. After all, what is life without love? The book isn't all sadness... There's laughter, hope and joy too. At the end of the book, we get "The Story Behind The Story", "Behind The Music", as well as an interesting interview with Gayle Forman, the author. This is a well-written, good read and a real page turner. I was compelled to keep reading. GREAT READ!